The front yard provides a pretty scene to view from the porch. A garden’s design is approached the same way whether the space is large or small, says landscape architect Pamela Palmer. First decide where you want to spend your time outdoors. If you like having your coffee outside in the morning, for instance, where’s the warmest, coziest place to sit? Where will you want to be at cocktail hour or when dining alfresco? Where do you want your children to play? Plan well and you can find room for it all, even in a tiny yard, Palmer says. • Screen with green. Plants provide privacy just as effectively as walls or fences. They also contribute color, texture, seasonal interest, movement, shelter for birds and other animals, and the sense of being in a garden, landscape architect Pamela Palmer says. You’ll see what she means if you picture solid walls instead of the gray-leafed pineapple guava around the front yard (on page 49) and the backyard (below left) without papyrus and bamboo. • Plant for permanence. Make evergreen foliage plants your primary source of color rather than ephemeral flowers, Palmer suggests. In the De Lorenzos’ garden, leaves provide burgundies (flax, loropetalum), tawny yellows (carex, miscanthus), and lots of blues (echeveria, lyme grass, palm, senecio), as well as a variety of green hues. • Open up. 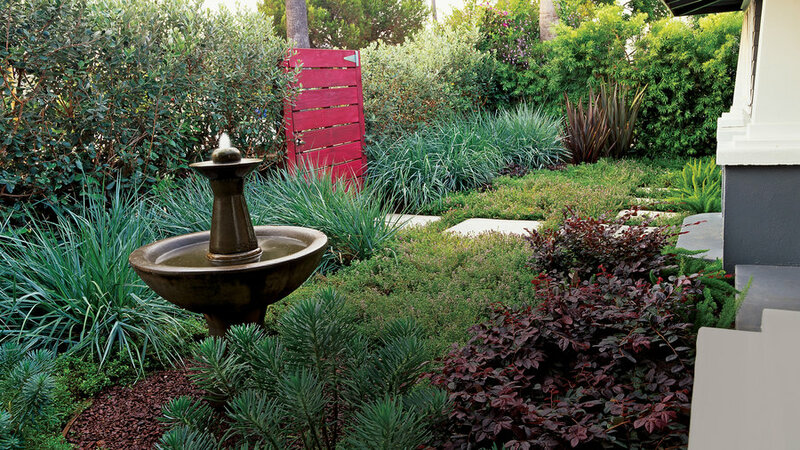 Leave an open section in the center of a small garden to maximize the feeling of space. “This allows you to see the sky,” Palmer explains. You can also use rows of low groundcovers to visually expand the space. The swath of ‘Reiter’s’ thyme down the center of the De Lorenzos’ front yard accentuates the width of the garden, making the whole area seem larger. • Overload the senses. Design your garden to indulge your senses. Bring in scented plants like the De Lorenzos’ aromatic thyme; sound, such as two gently gurgling fountains and wind-rustled papyrus; and touch-soft grasses and fleshy succulents. Small gardens don’t have to be cute. Nor do they have to be plain. They can be as dramatic as larger landscapes, says Pamela Palmer. But they need to be designed with care. The trick, the landscape designer says, is to balance boldness with simplicity.